There's never been a better time to be in the market for a skylight. Today's models are markedly more reliable than previous generations, while the familiar designs have been joined by new and exciting options. Picture the average lightbulb. Now picture sunlight streaming into a room in your home. There’s no comparison, right? By opening interior space to the outdoors and the sun, skylights usher in unparalleled brightness and vibrancy. Yet, even as they transform the character of formerly dark, gloomy interior spaces, skylights also deliver a practical, bottom-line benefit. Sunlight is free, after all, so that means adding a skylight means subtracting from your month-to-month electricity bill. Whereas older skylights earned a reputation for unpredictable performance, mainly due to moisture problems, the technology has improved by leaps and bounds in recent years. In fact, today’s homeowner can choose among skylight options that weren’t readily available, or didn’t even exist, only a few decades ago. If you’ve shopped for a skylight before, you know that historically, there have been two main types of skylights—fixed and vented. Either installs flush to the roof deck or on a curb raised slightly above it. True to its name, a fixed skylight is non-operable and intended only for the purpose of providing extra illumination. Meanwhile, a vented skylight can be opened, either manually or via remote, depending on the unit. Of course, remote-operable vented skylights cost considerably more than their manual cousins. And, by virtue of involving a greater number of more sophisticated parts, electric skylights are comparatively more vulnerable to problems. Still, vented skylights offer, beyond the aesthetic and perhaps emotional benefits of natural light, an additional way to admit fresh air into the home. Essentially, conventional skylights are windows on the roof. A newer option—tubular daylighting devices (TDDs) from Solatube International, Inc.—are a compact, efficient, and cost-effective alternative. Also sometimes known as tubular skylights, TDDs depart from the basic functionality of a window, and their innovative design clearly demonstrates that departure. On the roof, a weatherproof dome captures daylight, then channels it into your living spaces through highly reflective metal tubing. Where the light tube terminates, a special lens takes over to diffuse the harvested sunlight, evenly spreading it through the room in a pure white glow. 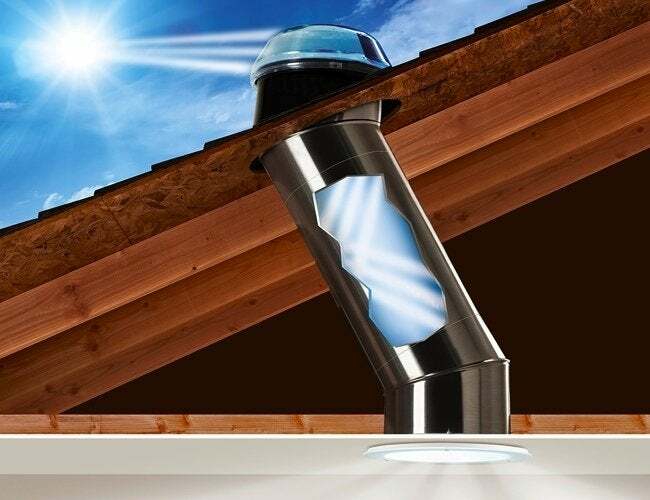 Solatube Daylighting Devices even allow for customization: You can add ventilation, a daylight dimmer, or a lightbulb add-on kit to create a multifunctional system. Once upon a time, skylights were nothing more than a single pane of glass held within a metal frame. Today, glazing runs the gamut from single- or multi-paned glass to advanced plastics, with or without insulation and coatings to control such variables as heat and UV radiation. In a traditional installation, glass would afford a more crystal-clear view to the outdoors. Plastic, though less expensive, boasts a few key advantages. For one, it’s more durable. Plus, whereas glass skylights are typically flat and rectangular, plastic can take virtually any shape, lending itself to any number of placements on the roof. More importantly, domed skylights—only possible with plastic—outperform glass, not only by shedding leaves and snow, but also by receiving sunlight even when it comes in at an angle. 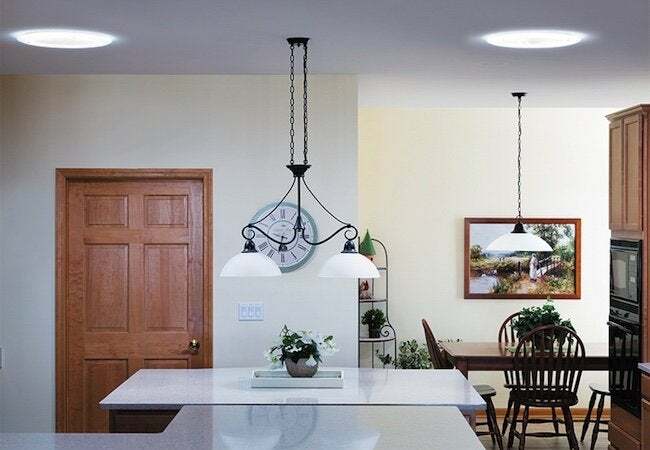 In its 30-year history, Solatube International has focused on a domed skylight alternative that, through its patented technology and leading-edge optics, corrects many flaws of earlier approaches to skylights. First of all, Solatube domes are leak-proof, impact-resistant, and self-cleaning, so you can enjoy trouble-free maintenance. You can also plainly see the Solatube International difference: Its light-capturing dome and reflector work together to achieve unsurpassed year-round performance. On the one hand, Solatube systems redirect low-angle sunlight so that even on winter days, your skylight functions satisfactorily. On the other, Solatube systems reject overpowering sunlight, so you don’t get too much of a good thing. 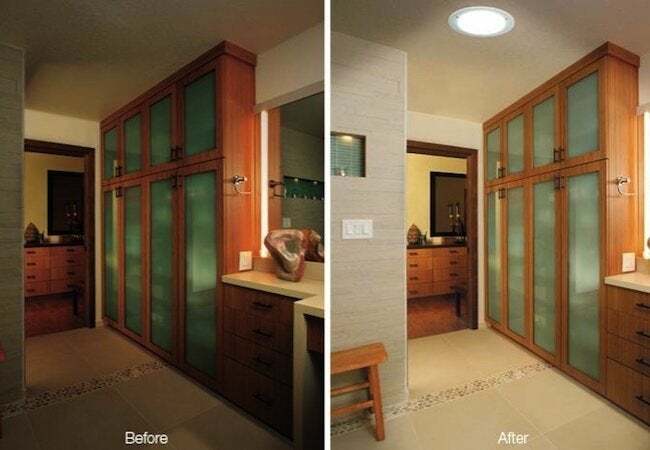 Inside, you can even tweak the strength and color of the daylight entering your home through the Solatube “effect” lenses. To choose the right skylight, you must account for the structure of your roof. Take a peek into your attic to assess the framing. How far apart are the rafters? Partly for the sake of convenience, conventional skylights come in sizes that fit snugly between the rafters of roofs with standard 16- or 24-inch framing. It’s not impossible to install a larger skylight—so long as yours isn’t a truss roof—but doing so goes beyond the abilities of the average do-it-yourselfer. Rafters must be cut, doubled up, and headed off—in other words, it’s no easy weekend project! Even a modestly sized conventional skylight can take days to install. Solatube Daylighting Systems take just a couple of hours. Depending on your skills and experience, you might even be able to handle the installation on your own. That’s because Solatube devices require no changes to be made on the framing, and there are no major ceiling or wall repairs required on inside. Rather than contend with rafters and joists, Solatube devices cleverly fit between such components, with their patented fastening system, adjustable-length tubes, and angle adapters all making for a fast and painless remodeling project. So easily routed, Solatube TDDs can illuminate those spaces you never thought daylight would reach. Because the light-channeling tube in the Solatube system extends up to 30 feet, the room you would like to brighten doesn’t have to sit directly beneath the roof. 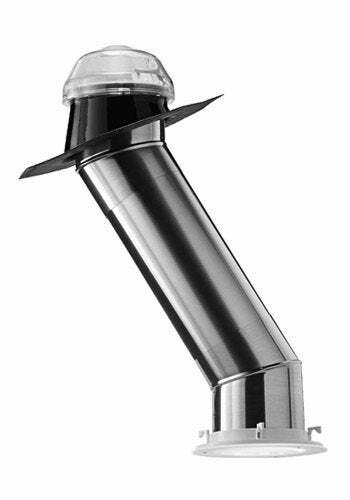 The tube component of the system can travel through attic, utility, and wall spaces to deliver natural light virtually wherever you want it, even the ground floor or basements in a multi-story home. Skylight prices vary widely, depending on the options you choose. Homeowners are wise to consider, not only the upfront product and installation costs, but also the ongoing impact the skylight may exert on heating and cooling energy bills. Though insulated skylights have become the norm, there remains a risk of efficiency losses offsetting the practical and aesthetic benefits introduced by the skylight. 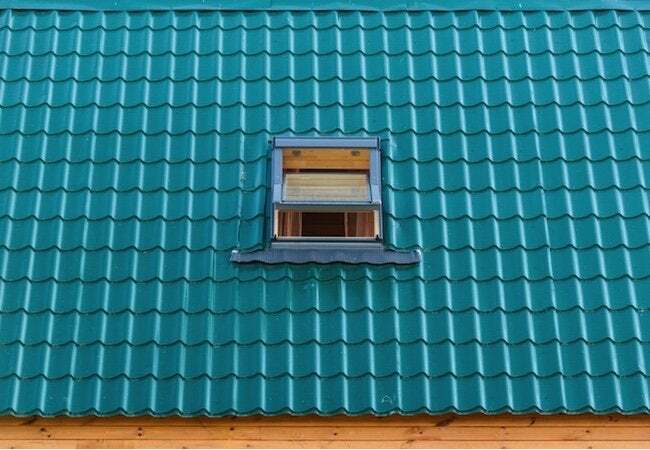 In winter, because hot air rises, inferior skylights lose more heat than a window. In summer, skylights admit more heat than a window, again by virtue of their placement on the roof. In either case, your HVAC would have to work overtime to counteract the skylight and maintain a comfortable temperature. Therefore, it pays to insist on a product with Energy Star certification. Energy Star-approved skylights, such as the daylighting systems offered by Solatube International, exceed the defined minimum energy performance requirement for climates around the country.